Students relax between classes in the on-campus housing at Rollins College in Winter Park, Florida. So many everyday activities in modern life are done over the internet. This includes everything from buying clothes to watching movies to even applying for admission to college. Almost every college and university in the United States now offers some form of internet-based application. And future students can see photographs of schools on their websites. Some even provide video tours. Candidates can find all kinds of information about the schools they hope to attend all over the internet. But Ed Bustos argues that students miss out on a lot when they only use internet information to make their college decisions. Bustos is the director of international admission at Rollins College, a private liberal arts school in Winter Park, Florida. Bustos says the best way to get a detailed look at what life is like at any college or university is by visiting the campus. 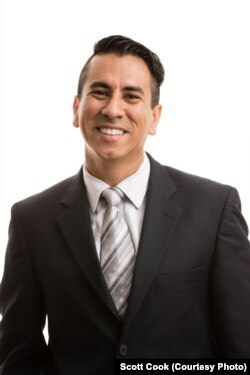 Ed Bustos, director of international admission at Rollins College in Winter Park, Florida. School visits are very common in the U.S., Bustos notes. Most students begin visiting colleges and universities of interest in the summer before their final year of high school. But, the majority of colleges and universities let interested students and their families visit their campuses at almost any time of year. Busto suggests that students contact the admissions offices of the schools that interest them. Then they can join other visiting candidates for a free guided tour of the campus. Current students usually lead the tours, Bustos notes. Their job is to provide information, offer advice and show future students all the different parts of the campus, such as housing and classrooms. So students should prepare plenty of questions. Bustos adds that students should not limit their questions just to tour guides. He suggests that students should also try to plan a meeting with an admissions official on the same day they come for a tour. Most schools keep a record of all the exchanges they have with candidates, he says. And trying to meet with officials in person to ask them questions shows interest on the part of the applicant, which schools like to see. Bustos also notes that it is never too early to visit a school. He says students should consider visiting any college or university they can. This could be years before they even start thinking about the application process. And it does not matter if the school they visit is the one they have interest in attending, he says. Simply witnessing the college experience in real life can be helpful for young people. Students walk across campus at Rollins College in Winter Park, Florida. That is why Bustos always enjoys seeing applicants bring any younger brothers and sister they might have with them on visits. Still, Bustos argues, there is more to visiting a college or university than taking a tour or meeting administrators. After all, he notes, most tours take place over several hours during the morning or middle of the day. That is when most of the current students are in class, so it can often seem like there is no actual student life going on at all. That is why Bustos says Rollins began offering night tours in 2017. That way visitors can see students, professors and employees involved in social activities and sporting events that happen outside of class hours. But he also notes that many colleges and universities in the U.S. are publically operated. This means anyone can enter the campus whenever they want. So interested students can take it upon themselves to see a different side of a school without a representative only showing them what they want people to see. 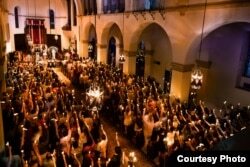 Students meet for a special event inside the Knowles Memorial Chapel at Rollins College in Winter Park, Florida. However, Bustos admits that visiting schools may not be a choice available to everyone, especially international students. And he says administrators understand this. So, he says, schools do not punish applicants for not visiting their campuses. Also, if a student is applying to several schools that are similar in size or environment, Bustos suggests visiting only one. That will still help the applicant imagine what it would be like to live and study at such a college or university, while cutting down on travel costs. Finally, for students who are unable to visit any schools they hope to attend, Bustos says there is one additional resource: social media. Many schools use Facebook, Instagram and Snapchat to advertise themselves. Current students are often contributors to these social media accounts. Bustos says schools will permit some students to post videos and pictures that show what their daily lives are like at college. These can provide applicants with a view that is almost as good as being there in person. Pete Musto reported this for VOA Learning English. Caty Weaver was the editor. How common is it for students in your country to visit the colleges and universities they want to attend before they apply? We want to hear from you. Write to us in the Comments Section or on our Facebook page.